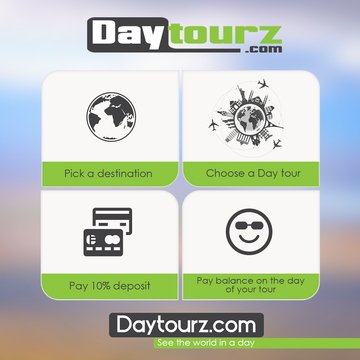 Welcome to Daytourz.com | The worlds first booking engine dedicated to day tours and local experiences in Africa. Daytourz fully understands that when traveling, your time is so often very limited. We have taken this into account with the design of our innovative and cost-effective way to find day tours so that you never feel as though you have wasted your time or money. We are incredibly passionate about everything Africa and we know exactly how to offer you the most exciting adventures south of Cairo. Whether you yearn for a once-in-a-lifetime wildlife safari in Kenya, a visit to the spectacular Victoria Falls, the Big 5 in the Kruger National Park, a local cooking class in Uganda, or the world’s highest sand dunes in Namibia, we have you covered!